While many agree upon the notion that freedom and democracy are two inseparable terms, (as in you can’t have one without the other), while most nations worldwide pride themselves in their achievements as liberal societies, while most wide affecting decisions are taken in some form of a collective process, there has always been a few (often characterized as expert) delegates who will take the final decision, or shape it in the most appropriate form. Government leaders, though elected by a large number of people in a democratic process are in the end singular leaders, not much different than kings or dictators, as their decisions, – correct or erroneous – affect millions, and they are prone to corruption. Be that as it may, most people feel more comfortable having the thought, that a more expert and wise individual is the responsible for the final decision, instead of the average minimum wage employee of a small town. Many may argue that giving the ability to propose anything and vote on anything, to everyone, may bring more harm than good and transform organized societies into a chaotic mess. This notion however comes in conflict with what democracy represents, being that if the populous is unable to self-govern it should also not be able to decide on its representatives. In this article we will try to explain why direct democracy is by far superior to any other form of governance. 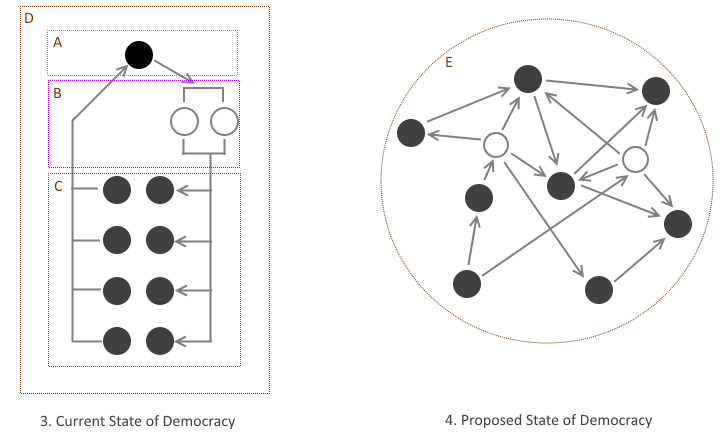 Unlike the current state of democracy , where the democratically elected leading individual is responsible for identifying, deciding and acting upon various issues and the larger mass of the voting population can only decide on who the leading individual will be, the proposed system has no man-in-the-middle. Instead each arising issue is decided via distinct stages in which everyone can be a part of. Note that in the first case, controlling the leader (weakest link) grants access to the identification, decision and action of any issue. The proposed system has no such individual thus eliminating the “weakest link” problem. In order to affect a decision one would have to affect the majority of the deciding population. A feat almost impossible considering that the population should have either a self-distracting nature or lack of the intellectual capacity to understand the harm they will self-inflict – which as stated above goes against the nature of democracy. Occasional faults which the community is bound to make, learn from, readjust and improve however are expected and considered a healthy state of an active, participating group. A society is a system. A system for the improvement of the life of every individual that is a part of it. In order to achieve the target goal, the system is guided through several stages that include the intended goal, the initial action, the reaction, and the comparison of that reaction to the actual goal. Again as seen in image  the populous and the leading individuals are disconnected. The guiding individual generates actions but feels no direct effect, as in most cases is protected by financial and legal systems (e.x diplomatic immunity) while the populous feels the effect but is unable to either identify the action that caused it nor change that action as they have transferred the necessary power to do so. The communication between the two is very weak consisting of occasional few minute statements on national networks and strikes or marches, which both are insufficient to transfer the details of problems and propose solutions. Note that under these conditions solutions may take months, years or even decades to appear. The proposed direct democracy system  however is more straightforward. The actions are generated by the populous and the effect is again inflicted upon the populous. The population can then compare and readjust to the new conditions. Looking at both systems from afar, they may seem like living organisms. A closer inspection however reveals that these two organisms are in fact very different as in the first case  the population is separated into a “head” consisting of a small group of deciding individuals and a “body” executing those decisions and supporting the “head”. The second system however  has no “head”. The entire body is consisted of a network of interconnected independent individuals. Epitome aspires to be the network, the neural system that will allow such an entity to exist. The technological advances in computing and communication have brought us in such a point in history that this feat is not only plausible, but necessary for the evolution of ourselves, our families, our nations and ultimately our world.